A rhinoceros makes the best kind of friend—and unexpected breakfast guest—in this hilarious and charming picture book from the creators of the bestselling Dogs Don’t Do Ballet. Daisy is eating her breakfast when a big purple rhinoceros strolls into the kitchen—just like that! Then it takes a bite out of her pancake—just like that! Daisy tries to tell her parents, but they’re much too busy to listen. So Daisy starts talking to the rhino instead...until her parents finally take notice of their enormous purple visitor! This funny, heartwarming story from the team who brought you Dogs Don’t Do Ballet is sure to bring a smile to readers who know the ups and downs of busy family life. A purple rhino moves in and the adults are oblivious. What's a kid to do?Daisy's parents never listen to her anyway. So when she tries to point out to Mom and Dad that a huge, purple rhinoceros is strolling into the kitchen, chomping a pancake, and heading upstairs, they mishear and dismiss her. The creature makes himself at home. He hangs out in the yard; he keeps Daisy company while she dons her roller skates; he even sits on the toilet. Steadfast Daisy, unalarmed, decides that since her parents are too busy to pay attention to her, she'll talk to the rhino instead. They become fast friends. Ogilvie uses pencil, pastel, ink, paint, monoprint, and digital tools to create lighthearted illustrations full of loose lines, enlivening the matter-of-fact, sometimes-bland text. Fanciful colors, overlaps of media, and colorings-in that escape their outlines make for a 1970s vibe. Humor and sadness blend: the rhino's single tear is poignant as he expresses his longing to go home ("a million miles away"), but Daisy's possible solutions include a hot air balloon and a bicycle, rejected because "the helmet would never fit." Only outside proof of the rhino's existence conquers Daisy's parents' denial, and the text dulls as Daisy reconnects with them, but the last page upticks in wit. Amusing and whimsical. Daisy’s parents are awfully busy. So busy, in fact, that they don’t notice the huge purple rhino that tromps into their kitchen, snaps up a pancake, and makes himself at home. Nor do they pay attention when Daisy tries to tell them there’s a huge rhino in their house. Luckily for Daisy, Rhino is not busy at all and he loves to listen. When her parents finally wonder about the missing pancakes, and Daisy tells them about her pachyderm pal, they hoot with laughter and take her to the zoo to show her a real rhino. Only, the zoo’s rhino, who happens to be purple and loves pancakes, is missing. A quick trip home reveals the truth, and Daisy and her sheepish parents help the rhino get back to Africa. Ogilvie’s loose, sketchy illustrations, full of loopy streaks of colored pencil and pastel in a saturated palette, are charmingly childlike and add to the droll atmosphere. As much a cautionary tale for parents as a giddy yarn for kiddos, this will make for an entertaining read-aloud. 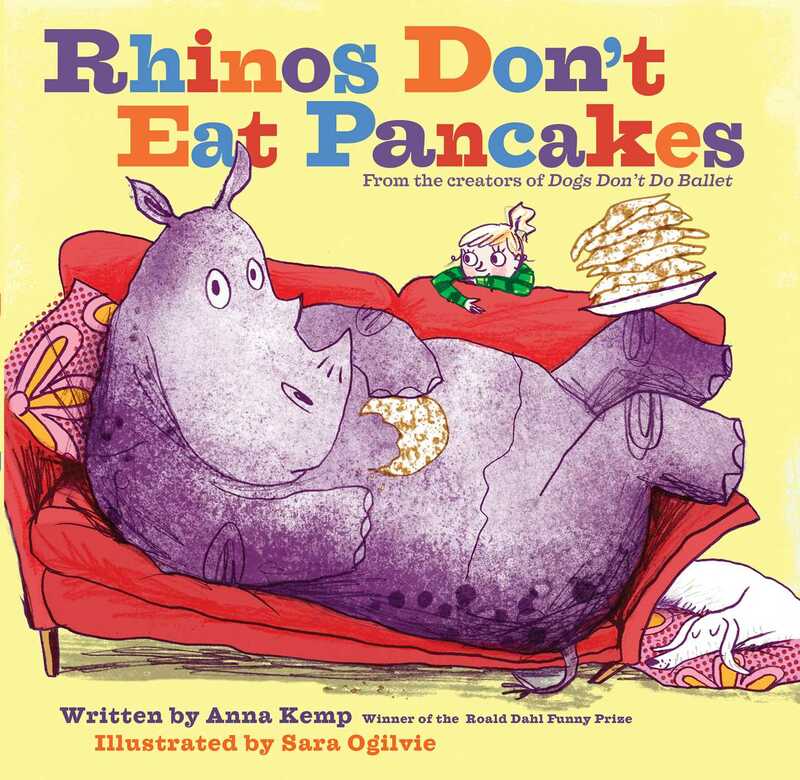 In this agreeably chatty book, little Daisy is eating pancakes when a big purple rhino “strolled into the kitchen. That’s right, a big purple rhino!” Daisy’s parents cut her off each time she tries to tell them about the rhino, who nonchalantly wanders around the house, even using the toilet (Daisy closes the bathroom door for him). Her parents eventually listen long enough to realize what Daisy is saying, but they still don’t believe her, so they take her to the zoo to show her what a real rhinoceros looks like—and end up surprised themselves. 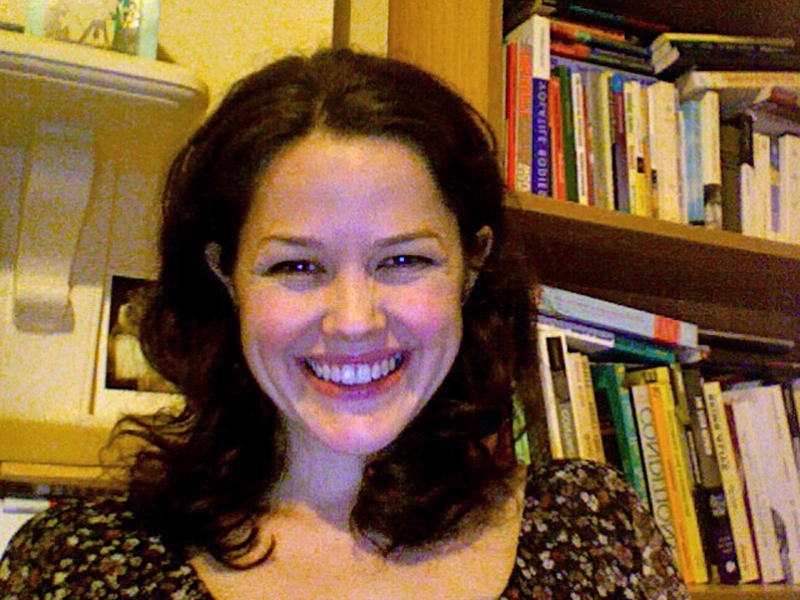 Ogilvie’s illustrations use a variety of media—pastels, paint, ink, and more—in an informal style that matches the tone of the casual text. The bright colors spill out of their lines, lines are sometimes scribbly or jagged, and the people all have perpetually startled wide eyes. Visual humor plays into every picture, such as Daisy’s parents sitting perched on the end of the sofa that the rhino earlier sat on (and broke). Most of the elements are familiar, from the unexpected visitor to the oblivious parents, but the humor is on target for the pre-K to third grade set, and it’s got great read-aloud potential for groups or at home.